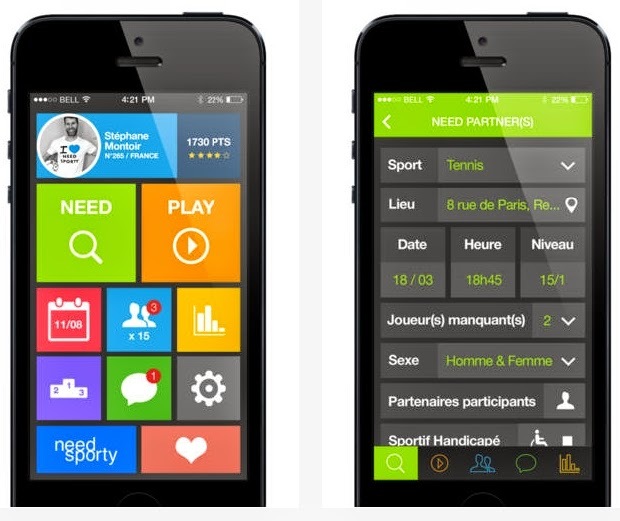 Need Sporty app, is a social network specifically dedicated to sports fans who want to find partners to practice their favorite activity. The principle is simple: You can post an ad and arrange a game by clicking on "Need" and filling information such as the type of sport, date, time, location, and number of desired partners. The converse is also possible: via the "Play" feature, the app can join games already organized. Everything is combined in a calendar. The option allows instant messaging of contact partners easily, without leaving the application. Need Sporty targets both valid, sportsmen disabled athletes. At this moment, Need Sporty is only available on iOS devices, but Android development is not excluded. The download is free, as well as the first month of use. Then it will cost 2.39 dollars subscription. The enforcement team says that this amount prevents the display of advertising, and that part will be donated to a charity.